When Cubify’s 3DMe launched, a market with long unmet demand was tapped. Every boy that’s played with action figures has wanted one of himself with his face, and I’d bet girls experience a similar desire. There’d be no more fighting evil robots vicariously through Scorpion or Hulk Hogan — with an action figure of me, I could fight off the robots. I mean, the kids could. Sadly, 3D printing hasn’t produced the personal action figure. Yet; of course, it’s always yet with 3D printing. They’re half a step away, as 3DMe does provide personal figurines, which is an action figure that isn’t poseable and can’t be played with. 3DMe offers a growing selection of body choices including chef, doctor, suit, surfer, and several sport themed uniforms. Cubify later launched a Star Trek version of 3DMe, which nerds rejoiced far and wide. Soon after, a TNG edition was added (the first was only uniforms from The Original Series)Those that always wanted to be a science officer on Enterprise could hold a miniature version of that reality that surely exists in some parallel universe. The latest installment of 3DMe is Horror. Just in time for Halloween, the Horror edition let’s you zombify and curse yourself with vampirism. These are also great gifts for any horror fans out there. The same simple procedure applies to making them as to all other 3DMe figurines: choose the body and attributes, upload a couple photos, and pay Cubify $69.99. Around 10 days later you’ll have 5.5 horrific inches of mini you. Chocolate is a hallmark of human achievement. Cars that drive themselves and nuclear energy are nice, but chocolate is its own currency. Its intrinsic value is off the chart as it’s the closest thing to an aphrodisiac known to exist. Studies have demonstrated that consuming chocolate releases dopamine, a brain chemical that’s associated with pleasure. Chocolate literally makes people happy. One of the lessons that 3D printing has taught us is that people like personalizing their goods. Make chocolate more personal and you’re looking at a recipe for success. And that’s what piq Chocolate and its Kickstarter project has done. Levi Lalla was introduced to rapid prototyping through engineering studies at MIT. While working at an engineering firm the idea of personalized chocolates occurred to him, so he started piq Chocolates in January. Using a 3D printer with chocolate means words, pictures, logos, and other designs can be added to chocolate bars. Lalla uses fine chocolate so the gourmet experience is only heightened by having an adoring message crafted into it. There are printers on the market that can print with chocolate but piq’s chocolates look better than any I’ve seen. The campaign funds are for a larger kitchen and more equipment. Eventually we’ll have easy to use chocolate printers for the kitchen, but until then take your custom chocolate business to piq. Since I started writing for 3DPrinter.net I’ve tried to experience as much 3D printing as possible. 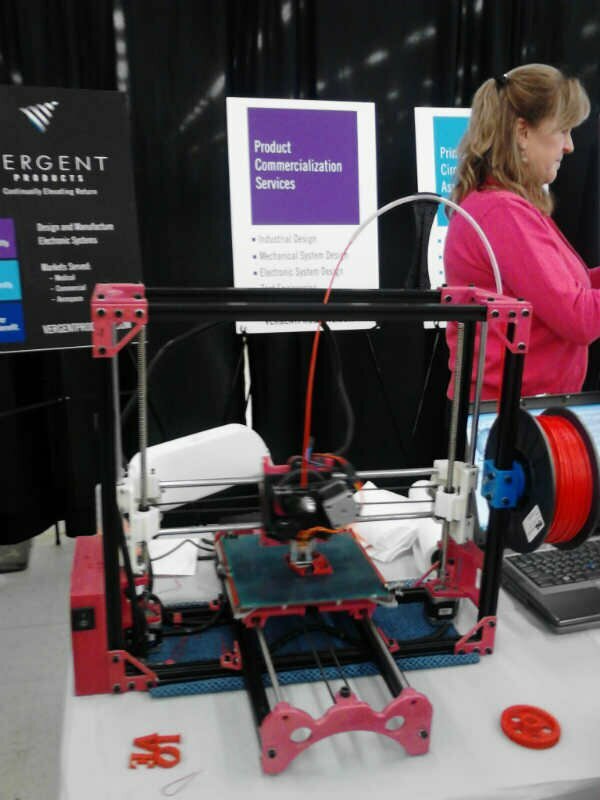 Between my visits to The 3D Printing Store, Phoenix Analysis and Design Technologies, and Chicago’s Inside 3D Printing Conference and Expo I’ve seen quite a few printers and printed goods. But I hadn’t been to a Maker Faire. I suppose I still haven’t been to a Maker Faire, but I have been to the NoCo (Northern Colorado) Mini Maker Faire. Loveland, being nestled right against the Rockies, is a beautiful place to visit. Autumn has brought its golden touch to the tree-dense town. There are still recovery efforts going on in response to the recent flooding, with FEMA trailers in the parking lot of the facility where the Faire was taking place. A volunteer told us the main parking lot was already full, and we arrived only 20 minutes after the doors opened so it was clearly a good turnout. For an event with Mini in the title, there were a lot of booths filling the large area. There were a lot of robots. Robotics and fabrication tools like CNC machines and 3D printers were probably the most prolific. Any booth with a 3D printer consistently had a crowd; I don’t know if it’s the precise motion or the electric whir or both, but a working 3D printer turns heads. 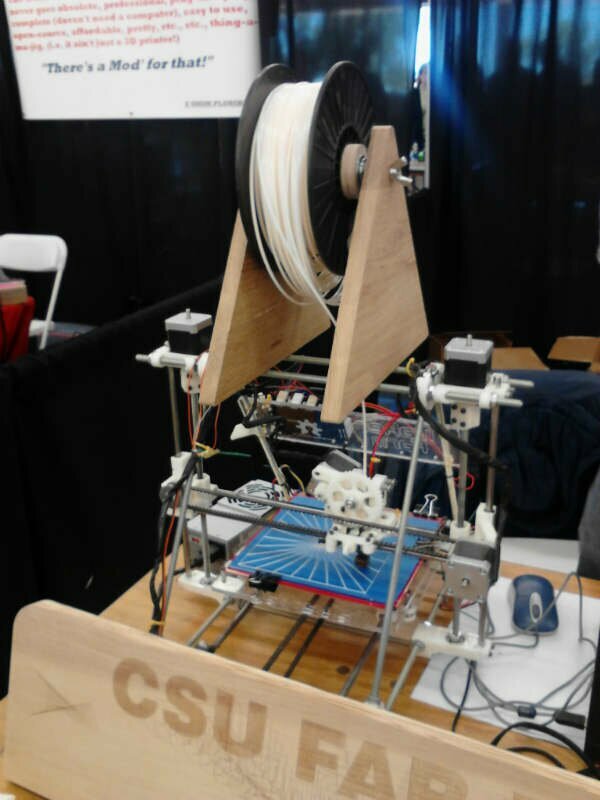 Plenty of booths were occupied by other makers armed with fabrics, wood, Arduino boards, electromagnets, and LEDs, but I was there for the printers. The first booth I stopped at was for Trimble, owners of SketchUp. The operator spoke to me about some of the printed models that were created with SketchUp, including a posable robot figurine. We also discussed Stratasys acquiring MakerBot, and how they’ll be competing with 3D Systems’ Cube; this will lead to more intuitive, powerful, and affordable printers. He said Trimble has plans to incorporate more 3D printing functionality into SketchUp to keep up with user demand. 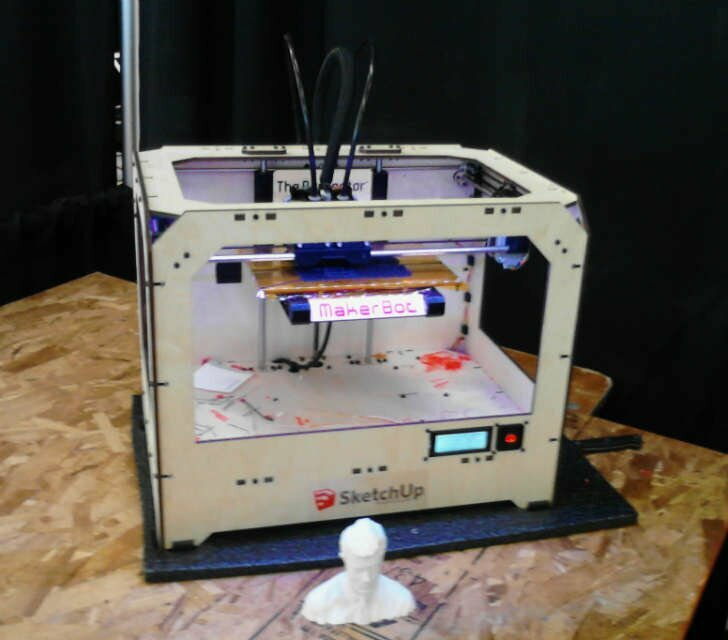 A MakerBot sat dutifully printing a Stephen Colbert bust on a back table. 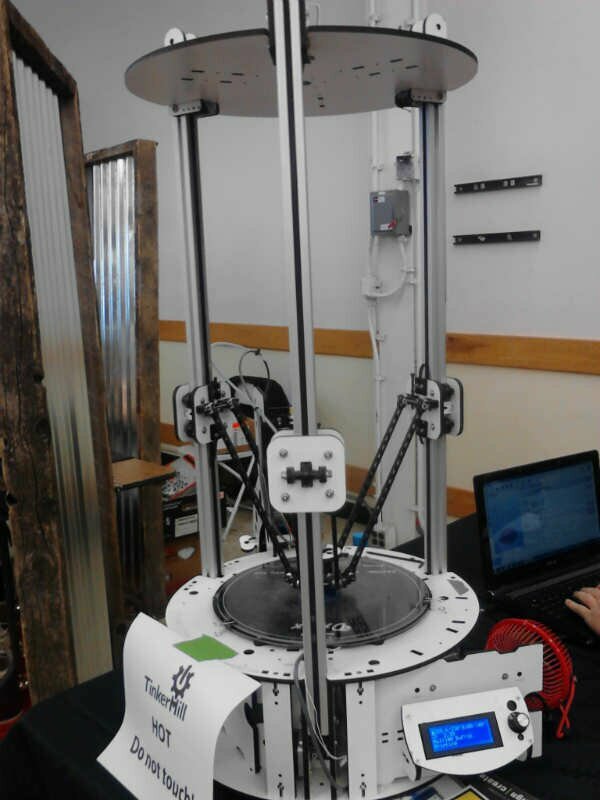 Fort Collins-based Ez3D was there showing off their crowdfunded Phoenix printer. Their focus is on affordable ease of use, so the Phoenix has its own software and it’s $399 assembled. The creators were demonstrating the print recovery function by forcing a print to fail. That’s not something other printers can do. Colorado State University Fab Lab was there informing inquisitors about their programs and services. There was a RepRap printing some fancy math art. CSU students have access to a Dimension uPrint Plus as well, which is great for engineering projects. Several booths were occupied by student organizations, which is encouraging. Among them was Metropolitan State University of Denver’s Art and Design with their Disruptive Fabrication Research Lab. Students are taught how to use laser cutters, CNC machines, and 3D printers. Their Ultimaker was hard at work. I was glad to see several hackerspaces there, a couple of which I wasn’t familiar with. TinkerMill is a non-profit hackerspace in Longmont that offers makers a helpful community. Members have access to tools, routers, electrical equipment, and a 3D printer, as well as the expertise of other members. They had a large SeeMeCNC Rostock printer on display. 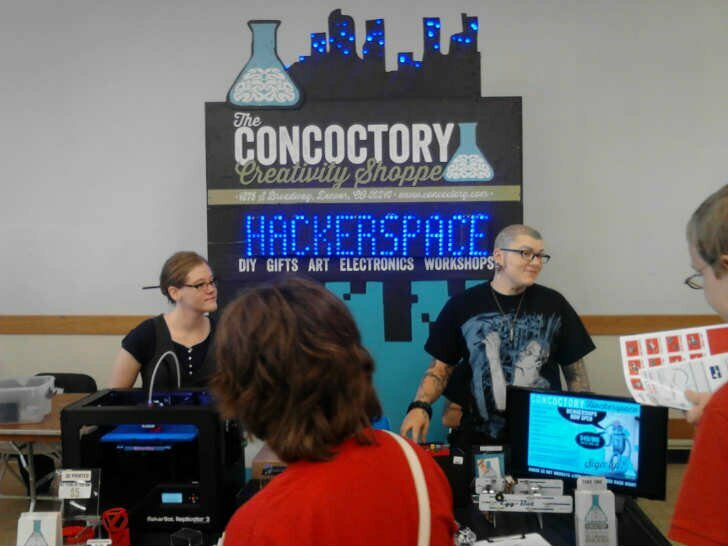 Another hackerspace in attendance was the Denver-based Concoctory. This place is also a retail shop for DIY gear, Arduino, and lock pick kits. They host workshops on soldering, microcontrollers, and various forms of fabricating. And of course they have a Replicator 2. Of course Afinia was there with their easy to use printer. The 3D Printing Store was there too but somehow I never saw them. 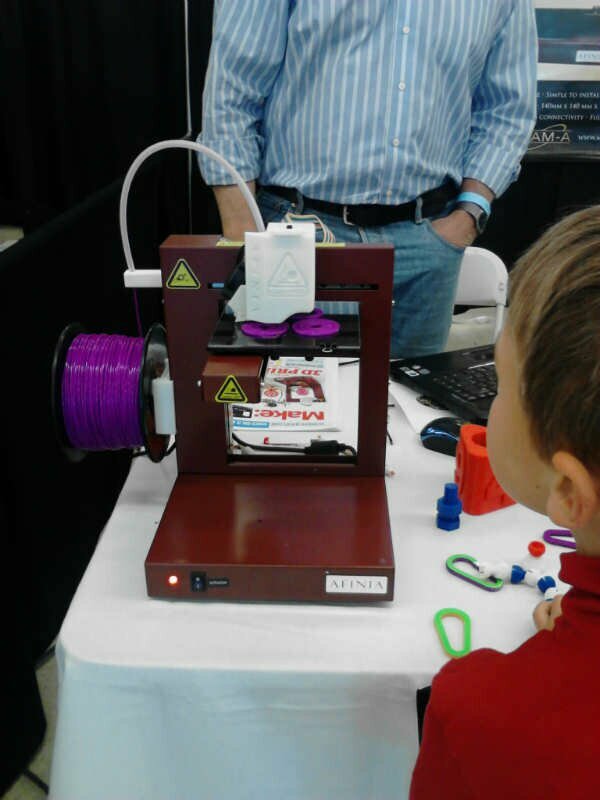 I did learn that the Loveland Public Library has a 3D printer, as well as the Anythink Brighton Library. It’s always good to hear about 3D printers in libraries. 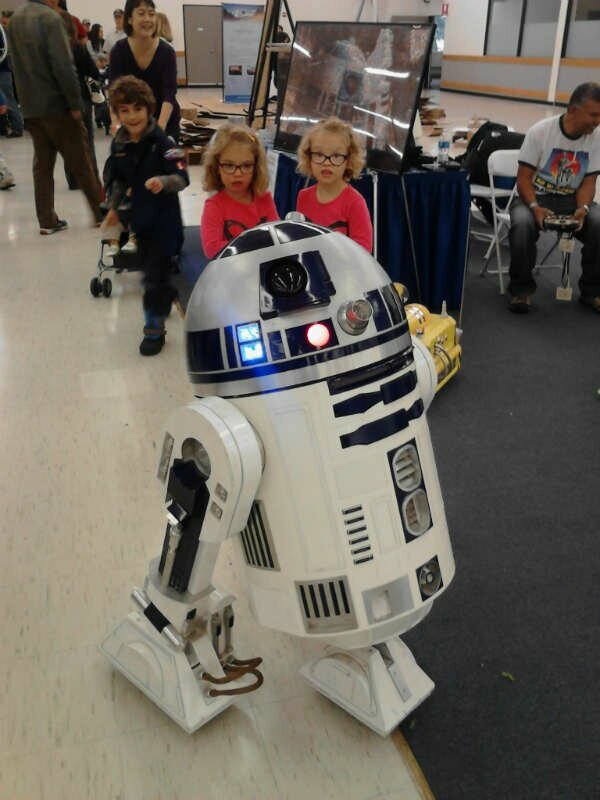 But of course no nerdy gathering is complete without R2D2. Outside of its own community, 3D printing continues to be a controversial topic. On the one hand there are those who believe that it may destroy capitalism by putting the means of production into the hands of the majority. Meanwhile, at the more sceptical end of the spectrum, critics continue to denounce 3D printing as having little real potential to make any substantial impact on the business world. Following the publication of my book “3D Printing: The Next Industrial Revolution” back in May, I have been invited to talk to many mainstream business audiences about 3D printing. Many such companies have included accountancy and consultancy firms, banks, and others who are not in the manufacturing sector. In this article (and its accompanying video) I’m therefore going to summarize the key messages I’ve been discussing with companies who want to learn more about 3D printing, but who are currently making little or no use of the technology. You may of course disagree with everything that I say! But if nothing else, I hope to spark further debate. As the growing number of articles on 3Dprinter.net demonstrate, 3D printing may now be developing very rapidly indeed. This said, until it can really transition into the mainstream, it will remain a somewhat niche set of technologies with limited business relevance. 3D printing cannot be all things to all people and all companies, and it is hence important to recognise that there are already a number of quite distinct opportunities associated with its actual and potential use. In broad terms these comprise enhancing product design, transforming traditional production, direct digital manufacturing, and facilitating personal fabrication. I will now discuss each of these areas in turn. Today, most large manufacturers use 3D printers to create rapid prototypes that speed or otherwise improve their product design. The use of 3D printing for this purpose is therefore not revolutionary. This said, as desktop 3D printers get cheaper and more reliable, opportunities are starting to exist to create concept models and prototypes far earlier and far more frequently. For example, only a few years ago, an industrial stereolithographic 3D printer cost at least $100,000. And yet a desktop model called the Form 1 will soon start shipping for $3,299. It has also been reported that some Ford engineers now have MakerBots at their workstations. The question for manufacturers will therefore increasingly be not whether they are using 3D printers in their product design, but where and how frequently. Today, for example, most people in sales and marketing departments who want a mock-up of a new product can at best request one from those people in their company or design agency who work in rapid prototyping. But this increasingly should not be the case. Just as computers escaped from corporate data centres in the 1980s and 1990s and started to be used by non-technical staff, so today it is time for 3D printers to invade a great many offices. Many traditional manufacturing processes are costly and time consuming to tool up. For example, the production of metal parts using sand casting requires a pattern to be created around which sand is packed. The pattern then needs to be removed from the sand, which often requires the mold to be broken apart and reassembled. Molten metal is then poured in, which rapidly cools solid. Finally the casting sand is broken away to reveal the final part. Today, 3D printers from pioneers including ExOne and Voxeljet allow for patternless sand casting. Here layers of casting sand are laid down, and selectively sprayed with a foundry-grade resin. This allows for the rapid creation of sand cast molds and cores which can then be used to produce metal components via tried-and-tested traditional means. By using 3D printed sand molds and cores, manufacturers can produce metal items with previously impossible geometries. Just as significantly, they can also save a great deal of time and money. For example, as reported in an ExOne case study, the US Naval Undersea Warfare Center (NUWC) managed to reduce the lead time for reverse engineering replacement submarine compressor pump castings from 51 weeks to 8 weeks, and the cost per pump from $29,562 to $18,200. Across many industries, similar opportunities exist to use 3D printing to reduce the time and cost of mold making or other production tooling, and this is something that no manufacturer ought to ignore. Indeed, in the short- and medium-term, transforming traditional production methods will be the area of industrial 3D printing application with by far the greatest business potential. As several pioneers now demonstrate, opportunities already exist to directly 3D print some final products or parts thereof. For example, Nervous System is already supplying lamps and many items of jewelry that are 3D printed. Using the cell cycle app on their website, customers can even create their own custom products, which are then 3D printed by Shapeways. Other pioneers of direct digital manufacturing (DDM) include MakieLab and ThatsMyFace.com, both of whom are using 3D printing in toy manufacture. On the Makie.me website, customers can design their own unique dolls that are then 3D printed. Meanwhile over at ThatsMyFace.com, customers upload a front and side image of their head, which can then be 3D printed and added to a range of action figures. Other companies creating customized products using 3D printers include Protos Eyewear, who are 3D printing spectacle frames, Bespoke Innovations, who 3D print fairings for prosthetic limbs, and Olaf Deigel with his famous 3D printed electric guitars. Earlier this year, Nike also got in on the act when it started selling its Valor Laser Talon football boot with a 3D printed cleat. A final and quite distinct form of potential direct digital manufacturing is bioprinting. 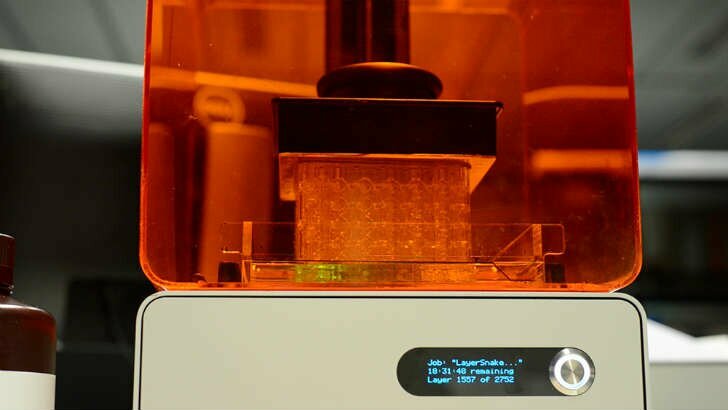 Here specialist 3D printers lay down layers of cells that fuse together to create replacement living tissue. Already pioneers including Organovo have managed to bioprint human arteries and liver tissue. At present applications are limited to the creation of tiny tissue samples for drug testing. But within a decade or so we should expect the first use of bioprinted materials in transplant surgery. In time, healing wounds by bioprinting directly onto the body may also become a possibility. This is indeed something that is already being worked on at the Wake Forest Institute. As any regular reader of this website will know, personal 3D printers can now be built or purchased for a few hundred dollars. As such hardware enters the mainstream, more and more people will have at least the potential (if not necessarily the time and inclination) to start 3D printing things at home, and smart businesses are already starting to recognize this fact. For example, in January 2013, Nokia released a 3D printing development kit for its Lumina 820 smartphone to allow anybody “versed in 3D printing” to produce a custom casing. 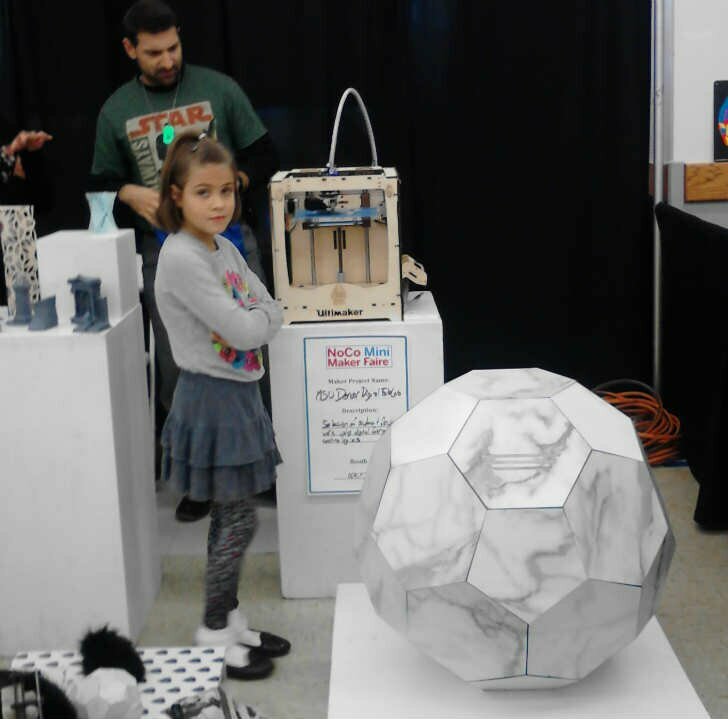 And within only six days, 3D printing enthusiasts were showcasing their designs. In addition to helping customers modify, repair and personalize products, many organizations could very easily start to offer promotional 3D object downloads. Today free apps or screensavers are common in the entertainment industry, and within a year or so any marketing campaign that does not include 3D printable content will be missing an easy trick. In retail, there are also opportunities to start selling both consumer 3D printers and consumables, as well as 3D printing and scanning services. In 2013 some of the first 3D printer stores opened around the world. But right now most people do not live near such a retail location, which leaves a clear gap in the market. Those who suggest that 3D printing will bring down capitalism by putting the means of production into the hands of the majority do tend to forget that somebody will still have to sell people the printers and consumables! So what do businesses need to know about 3D printing right now? Well, here are just some of my own predictions. Firstly, 3D printing will drive a revolution, but it will not replace most traditional manufacturing methods. Rather, I estimate that, within ten years, 3D printing will be used directly or indirectly in the manufacture of about 20 per cent of products or parts thereof. I would also stress the “indirect” bit here, with the use of 3D printing to produce molds, cores and patterns being very significant over the coming decade. This sort of thing may never be seen by most consumers. But it will nevertheless add significantly to the bottom line. Secondly, the desire to achieve material savings will drive the adoption of 3D printing in many industries. This is due to the fact that 3D printing is an additive rather than subtractive process that can achieve minimal wastage. Recently I was talking to a director of a very well known car manufacturer who admitted that, when producing some aluminium parts, only five percent of the metal used actually ended up as part of a final component. The rest was simply machined away via traditional subtractive manufacturing methods. The opportunities to develop 3D printing technologies so that we can increasingly make the same things but with fewer raw materials may therefore be very significant indeed. Thirdly, within a decade, scanning and digital inventory will have a big impact on spare part availability and product repair. Recently the Economist reported that a typical F-18 fighter jet now has about 90 3D printed components, as these provide the most cost-effective manner of keeping these 20-year-old planes in service. With natural resources continuing to deplete at an alarming rate, increasingly we will need to repair rather than replace broken items, and it is 3D printing that may well actually allow this to happen. Fourthly, opportunities will increasingly exist for customized products with one or a few 3D printed parts. Today far too many companies are dismissing 3D printers as production tools because they cannot manufacture an entire product. In sharp contrast, a few smart pioneers – such as Nike and ThatsMyFace.com – are starting to customize or otherwise transform their wares by adding the odd but very strategic 3D printed component. Fifthly, I believe that software development will determine competitive advantage for many pioneers of fully or partially 3D printed products. Soon everybody will have access to the same industrial 3D printers. Successful companies will therefore be those that create the best interfaces between their customers and 3D printing hardware. Just take a look at the cell cycle app from Nervous System, or the Make.me design page, to see examples of how some pioneers are already excelling in the design of software tools that allow anybody to customize 3D printed products. The future is not about everybody learning CAD, but about smart companies creating a wide range of customized customer apps. Finally, sometime in the 2020s and 2030s, bioprinting will become a standard medical practice – a subject I say far more about in my biocomputing video. The adoption of most new technologies follows a well understood curve, and for 3D printing several of these may now be identified. Reflecting the four areas of 3D printing application detailed above, these curves are as illustrated in the figure that accompanies this article, or in my video of the same title. The exact placement of the four curves in the diagram is of course a best guess, with only the starting points being definitive data. 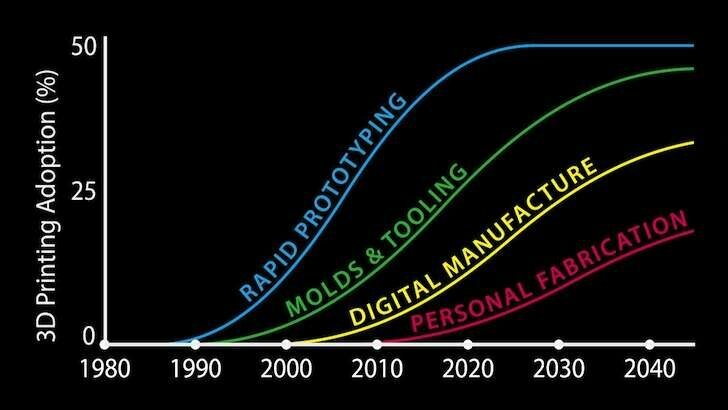 This said, what I hope the diagram does signal is how important it is that 3D printing is not viewed as a set of technologies with just one area or timescale of application. It is likely to be decades before direct digital manufacturing and personal fabrication are anything like mainstream activities. And yet, as I have argued, this should not prevent businesses and their investors from recognising the key and earlier opportunities to apply 3D printing to transform more traditional design and manufacturing processes. The first-mover opportunities that may be associated with catching a ride on the early 3D printing bandwagon ought also not to be ignored. Granted, during the Dot Com boom and bust, many new businesses lost their investors a fortune by wedding them too early to a misunderstood technology and social trend. This said, back in the late nineties and early noughties, many traditional businesses played a rather smart game by dabbling with the new technology but not betting everything on it. This is also something that many companies today ought to reflect on in their current evaluation of the rising 3D printing revolution. Christopher Barnatt’s book 3D Printing: The Next Industrial Revolution is available on Amazon in paperback or Kindle format. Sorry to bust your bubble, but you can’t go to your local Office Depot and buy a Cube off the shelf just yet. Unless you live around Denver that is. Office Depot announced the pilot program last week and the printers have been on display since Monday. Denver is in my neighborhood so I made a visit to the Office Depot on Wynkoop. Entering the store, the Cube is displayed straight ahead so seeing it is guaranteed. It was printing a set of blue nuts and bolts, safely and silently encased in an acrylic box which is likely there to keep people from touching the hot end. A selection of rooks, gears, and vases in various colors sat around it. A representative came over as soon as he saw me at the display. He seemed excited to have the printer in-store, eagerly showing me a part of a turbine he’d printed. His knowledge of 3D printing was mostly limited to the Cube, which makes sense. He knew how long every piece took to print (the green rook took an hour and a half and the red twisty gear took 17 hours). There was no CubeX on display but I was told that there would be one soon, and that there are plans to test an in-store print service in Q1. That wasn’t mentioned in the press release so hopefully he doesn’t lose his job for revealing company secrets. I filled out an entry for the Cube giveaway and left. The Cube is going for $1299 in-store. In two days, none had been sold yet, but they have only four in stock so a huge demand would be met with “You can purchase one on our website.” Office Depot has over 1,600 stores worldwide and sells electronics in 60 countries. So if the pilot is successful the potential impact on the 3D printer market could be dramatic. Currently most revenue in the industry is for commercial printers and services, but the shift of desktop 3D printing from hobby/DIY to mainstream will shift some of that revenue. As investors witness demand for desktop printers more money will go into developing them further. It was cool to see a 3D printer on a major retailer’s shelf though, almost surreal in a nerdy way. We’ve been talking about the Third Industrial Revolution and the democratization of manufacturing for a while now, and a lot of the progress is subtle and behind the scenes. Seeing a large step first hand is something I’ll remember. Professor Jim Scanlon, ofvthe University of Southampton’s Computational Engineering and Design Research group, says: “The flexibility of the laser sintering process allows the design team to re-visit historical techniques and ideas that would have been prohibitively expensive using conventional manufacturing. One of these ideas involves the use of a Geodetic structure… This form of structure is very stiff and lightweight, but very complex. If it was manufactured conventionally it would require a large number of individually tailored parts that would have to be bonded or fastened at great expense.” SULSA was printed on an EOS nylon laser sintering machine in a manner that allows all the pieces to be snapped together without tools. The purpose of the project was to demonstrate the practicality of designing UAVs to be printed. It was a 100 mph success. Steven Easter and Jonathan Turman designed this printable UAV for Mitre Corporation. It flew over 40 mph on its maiden flight under the interested eyes of the US Army. I wonder what the Army wants with 3D printable drones… err, UAVs. The University of Maryland’s Maryland Robotics Center was contracted by the Army to design the Robo-Raven as a surveillance tool that would blend in with its surroundings. Its printed components imbue the bionic bird with an agility that’s so similar to real birds that real birds of prey have actually attacked it. And the Robo-Raven is evolving, now being powered by solar cells attached to the wings. Based on the SULSA, University of Southampton designed the printable 2Seas for the European Coast Guards to monitor and prevent drug smuggling through the North Sea and English Channel. Its unique design lets it fly for five hours on seven liters of fuel, which is quite efficient, and it’s already been successfully tested in unfavorable weather conditions. 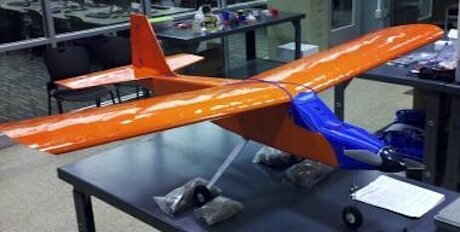 This UAV company originally bought a Stratasys Dimension 1200 with the intention of using it for producing prototypes and promotional goods. Little did they know that they’d start using the printer for manufacturing actual UAVs. The rapid changeability that comes with 3D printing allows the engineers to design around requests from clients. Complex geometries and other shapes that are difficult for conventional manufacturing to produce are totally possible with 3D printers. And the weight-to-volume ratio for printed components is phenomenal because density can be controlled. This trend will surely continue until cargo and passenger planes are printed. Copyright is a tricky thing. As manufacturing becomes more and more automated through robotics, IP (intellectual property) theft becomes easier and easier. 3D scanning too makes illegally copying of physical components more accessible. Chinese clones of popular electronics has been an ongoing problem for some time; even the 3Doodler has been cloned. Of course, digital piracy has troubled businesses in every country since I was in high school. 3D printing occupies a space that’s both digital and material as far as design goes, so copyright protection gets especially hairy. And here steps in Fabulonia, creators of FabSecure, a cloud based file management and encryption suit that networks 3D printers and protects prints. Typically when an STL is prepared for a printer it’s just sliced into gcode, which is then sent directly to the printer. There’s no security whatsoever. Anyone that has access to the STL can duplicate, modify, and print it. With FabSecure, STLs are encrypted through a patents pending Multidivision Encryption device and stored on a cloud that’s networked to all your printers and any printers that are shared with you. The device just hooks up to any network and does its thing. Prints (files) are never sent in their entirety; rather, they’re streamed through a(nother) patent pending protocol. This allows users to control access to designs/prints and monitor how many times each object has been printed (as well as if each print was successful. The control panel allows designers to share their prints for collaborative purposes without fear of them being stolen. Encrypting prints is not new; Layer by Layer does something similar by sending prints instead of printable files. FabSecure’s method of streaming prints is unique though; it detects and blocks intrusion attempts and tolerates network interruptions. The suite also allows the sharing of printers, so office mates can all use one printer and have different levels of access to the same designs. I’m not sure how much the device is, or how much the subscriptions cost, though the lowest tier plan has no monthly fees. The highest tier plan lets users monetize their designs through online stores. The site says FabSecure works with any printer, but it also states that it’s compatible with MakerBot Replicators, so maybe they’re planning on adding other printers over time. If the costs are reasonable and the service does indeed work with any printer I can see people using FabSecure. Computers are easier to use than ever. GUIs (graphical user interfaces) have come a long way after decades of feedback. Children are taught how to operate computers with a mouse and keyboard from a young age. And now touchscreen tablets make computing even easier to learn and use. But tomorrow’s computers will be still easier to use. We showed you the Tony Stark-like interface that Elon Musk scripted together with a Leap Motion, but there’s a consumer version hitting the market soon called SpaceGlasses. Woah. That’s slick. SpaceGlasses are essentially a HUD, cameras, and a computer to tie them together. Operation is entirely gesture controlled. Apps are opened by touching icon buttons that float in the user’s view. Sculpting a printable vase is as simple as waving your hands in the air. Printing it is as simple as placing the virtual model onto the actual printer. I cannot imagine how it could be any simpler, besides the printer being controlled directly by thoughts. And SpaceGlasses do so much more than that. As the video demonstrated, they can identify people in real time and give you information about them. Imagine that being applied to troubleshooting a 3D printer: by analyzing a failed print the SpaceGlasses could provide possible explanations and solutions, like “Not enough extrusion; Try slowing the print speed and/or raising the hot end temperature.” Oh, how I could have used that. Nearly two decades after Nintendo’s Virtual Boy debuted, we’re finally getting practical virtual/augmented reality devices. Sculpting and modeling printable objects will soon be more comparable to conventional sculpting than to CAD. Operating a printer (and other devices) will come with a virtual assistant that’s actually helpful, showing us our mistakes and how to fix them. Pieces will be edited by multiple people at once, all looking at the same empty space on a table. That’s pretty close to a holodeck experience. You can reserve a piece of the future for a smooth $667. Historic sculptures and artifacts are beginning to be liberated from museums for all to enjoy, as people and organizations create scans of the pieces and then 3D print them for others to see. We profiled Cosmo Wenman this summer, who has been given permission to scan any object at the Skulpturhalle Basel museum in Switzerland. But what about paintings? Just taking a photo of a work and reproducing it in perfect color still lacks the texture and depth of the original. And that’s because, while we think of them as flat, they are really not merely two-dimensional objects. Even though the third dimension, which includes the brushstrokes and texture of the canvas, is not very thick, it does indeed exist and needs to be replicated to create a reproduction that truly looks like the original. Fujifilm and Canon have leveraged their 2D image duplication expertise into 3D processes that will capture that third dimension, and are already reproducing some of the world’s greatest paintings, such as Van Gogh and Rembrandt. Here’s a quick rundown on what they are up to. 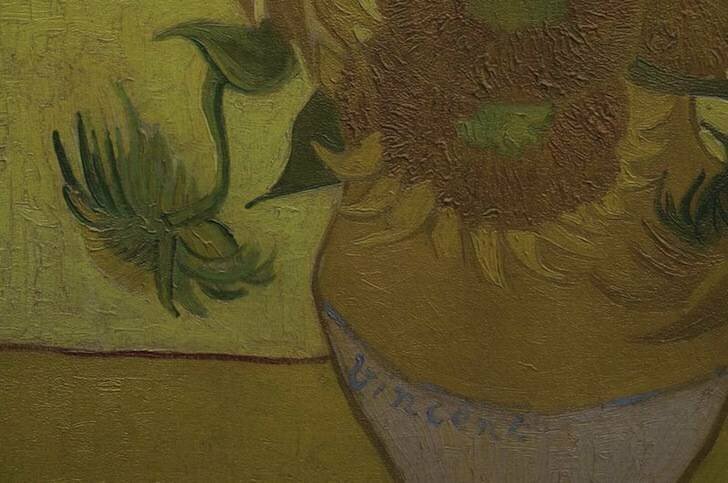 Detail of Relievo ‘Sunflowers’, Van Gogh Museum, Amsterdam. Seven years in development, Fujifilm’s Reliefography reproduces an entire painting, including the frame, canvas, colors, brightness and individual brush strokes. It even reproduces the torn labels and hand-written notes on the back of the canvas. A 3D printing project with the Van Gogh Museum has been developed in cooperation with FUJIFILM Belgium NV, Sint-Niklaas, Belgium. The product resulting from this cooperation is called Relievo, a premium three-dimensional replica of Van Gogh masterpieces. The originals are recreated in size, colour, brightness and texture to achieve an ultimate fine-art reproduction. The Relievo not only recreates the front of the original painting but also the back of the paintings including all labels and stamps that were added over the years on the frame. The Relievos are checked and officially approved by curators of the Van Gogh Museum. 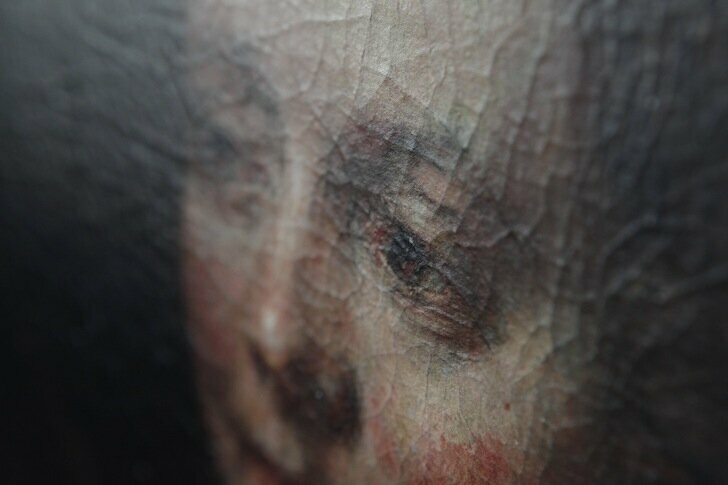 Rembrandt reproduction up close. More photos here. Not to be outdone, Canon’s Océ Group, which creates the company’s large format printers, has their own approach for reproducing paintings. 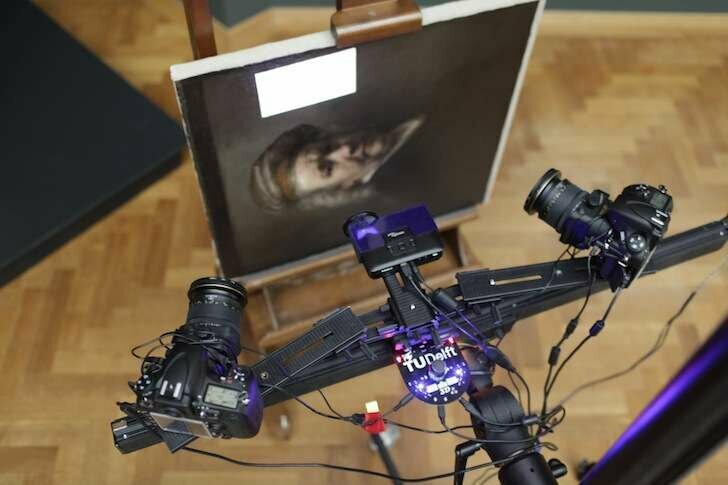 The group, along with with Dutch researcher Tim Zaman, have been working with the Rijksmuseum and Kröller-Müller museums in the Netherhlands to develop a system that can capture every detail of a painting and reproduce it. The scanning equipment consists of two Nikon D800E digital cameras, lenses, and a picoprojector, and together provides for 40 million points per capture, The painting reproduction is printed on an Océ 600 ppi 3D printer. As with the Fujifilm system, it captures the fine details like brush strokes and texture.